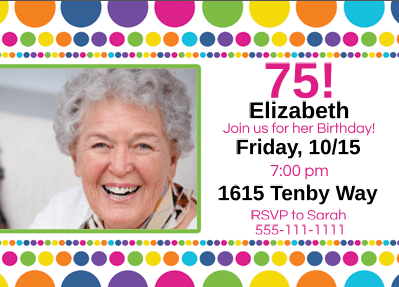 Carefully chosen 75th birthday invitations are the ideal way to set the tone of your party. Your guests should know from the invitation what sort of party it is – a surprise party, a formal celebration, or a casual get-together. Just click on any picture for more details or ordering information. 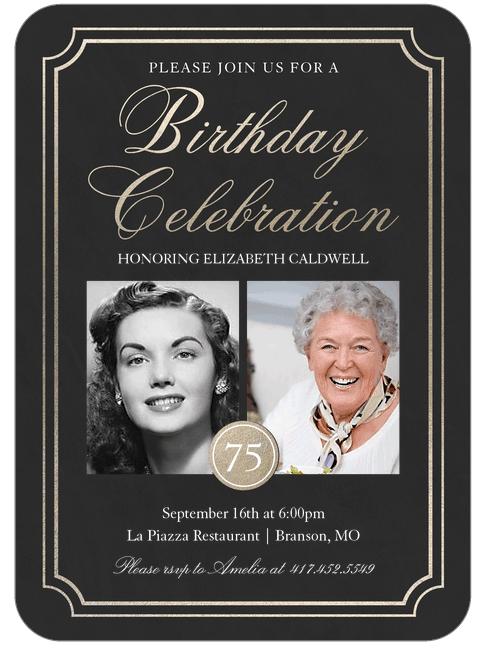 A milestone celebration like this calls out for memorable invitations! 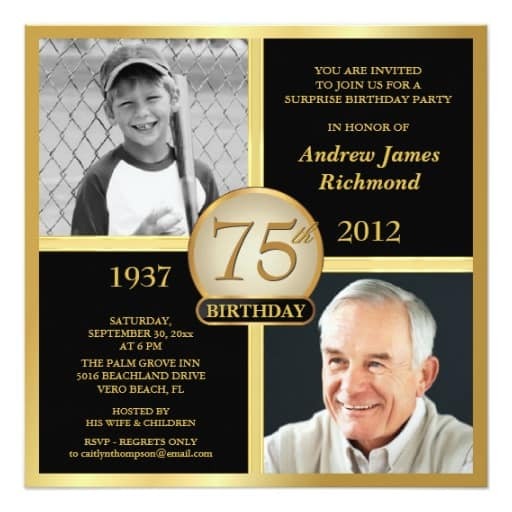 Photo invitations serve two purposes – they act as invitations, but are also a special keepsake for guests to cherish. I particularly like invitations that allow you to add 2 or 3 pictures of the guest of honor (like the adorable invitations pictured above). 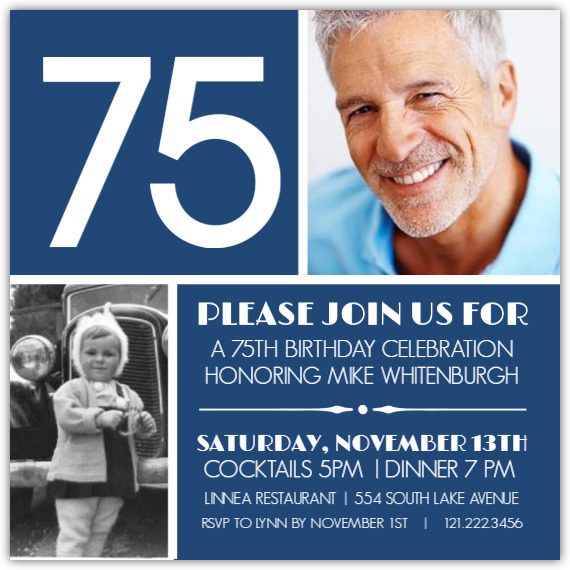 You can choose current pictures, but I think using pictures of the guest of honor as a child adds extra charm. 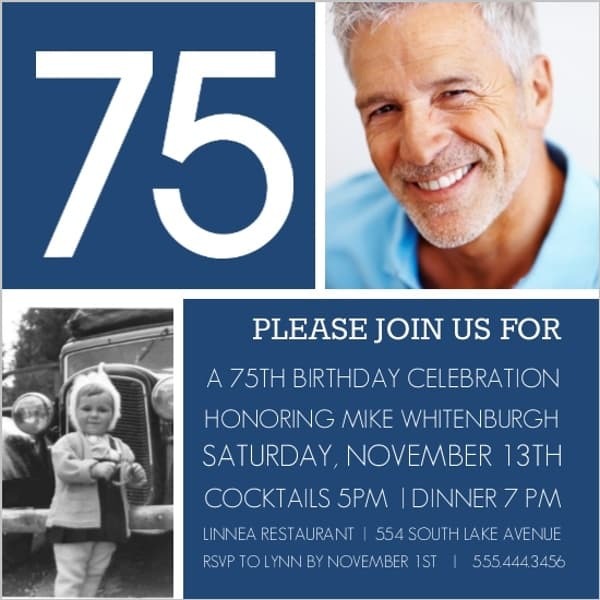 Photo invites are actually very easy to order online. 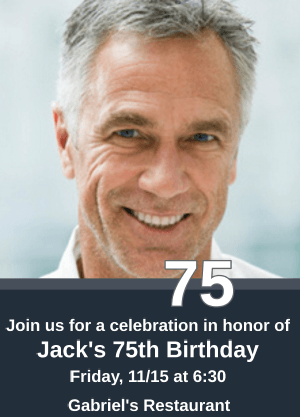 Just upload your favorite picture or pictures, add your party details, and you’re ready to go. 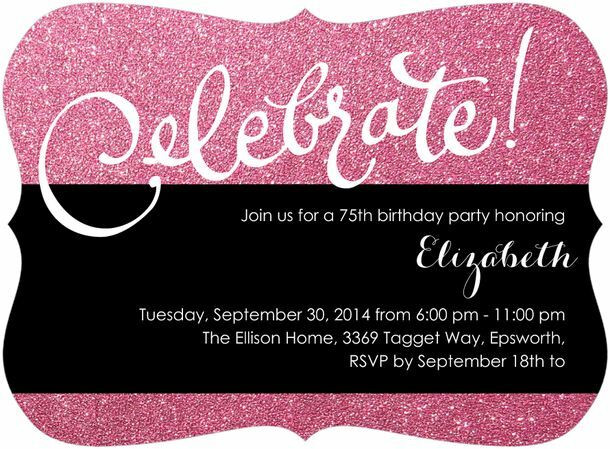 It takes just a few minutes longer than ordering regular invitations. The hardest part is choosing your favorite invite! 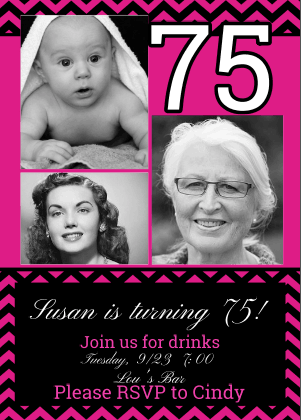 For a 75th birthday, I like to look for invitations that emphasize the number “75”. After all, this is a milestone birthday – you’ll want to make sure that all your guests know! 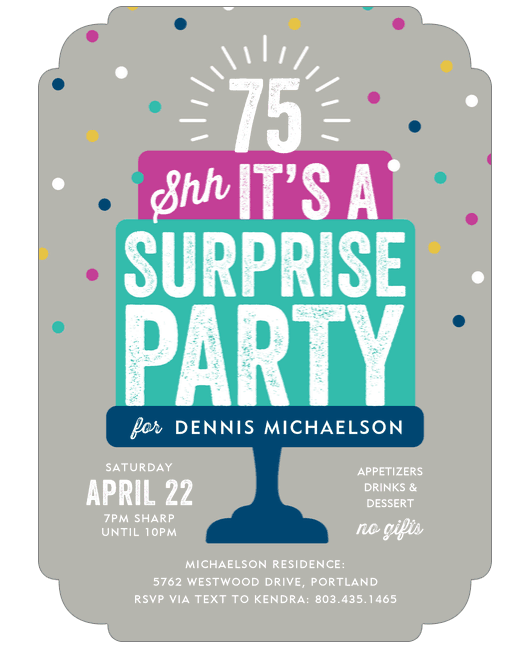 The invitation pictured here is a perfect example…you can’t miss the number “75”. 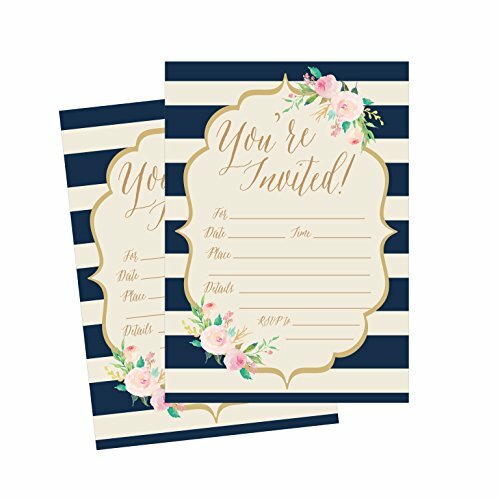 Look for invitations that match your color scheme or party theme – and be sure that there’s plenty of room for all the important party details! 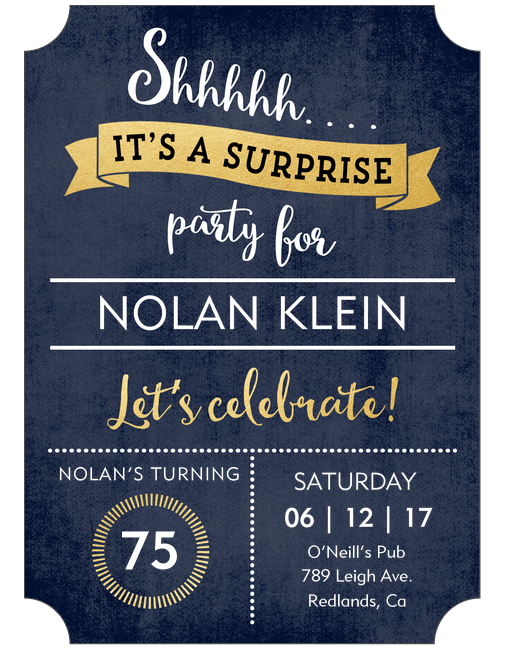 Many personalized invites will allow you to add a picture or a map to the back of the card – which is sure to save your guests stress (and driving time) on the night of the big event! 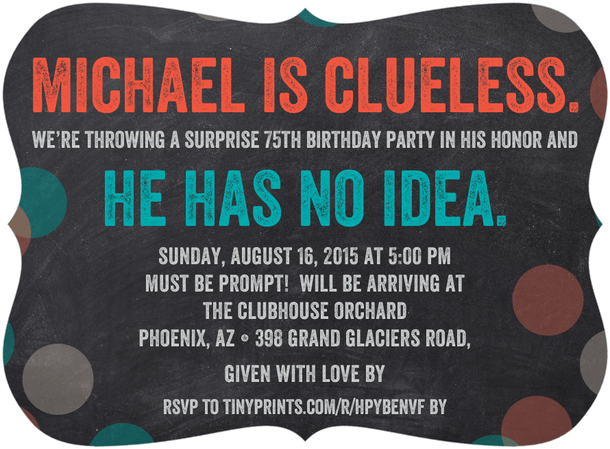 If you are planning a surprise birthday party, be sure to highlight that information at least once -and preferable twice - on the information. Choose your words carefully so that everyone knows that the utmost discretion is required. You don’t want the guest of honor to have any hint about what’s in store for the big occasion! 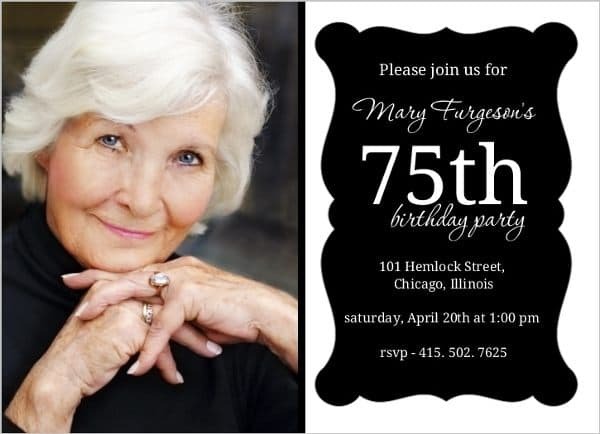 For RSVP information, be sure to leave a phone number or email address that the guest of honor doesn’t usually have access to. You don’t want someone to leave a voice mail about that party that can be overheard by the guest of honor! There are plenty of delightful options available when selecting invites for women. Try to incorporate some of the guest of honor’s favorite colors into the design. Feel free to add glitter or sparkles if she’s a glamorous kind of woman! Some of the popular patterns for women include damask (very elegant), floral (either casual or formal), and monogrammed. 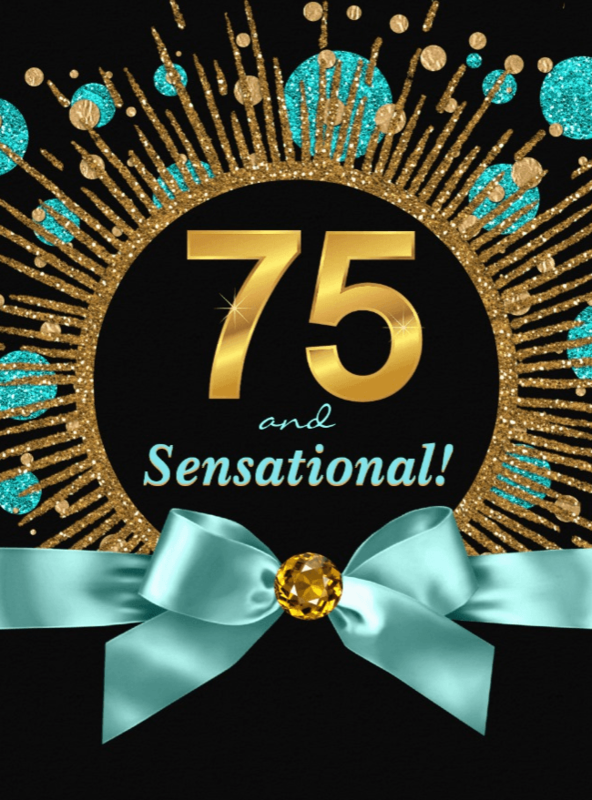 If she’s sensitive about her age (you know how some women can be), you might not want to send cards that have “75” as a primary feature. Go for a more understated look so you don’t hurt anyone’s feelings. 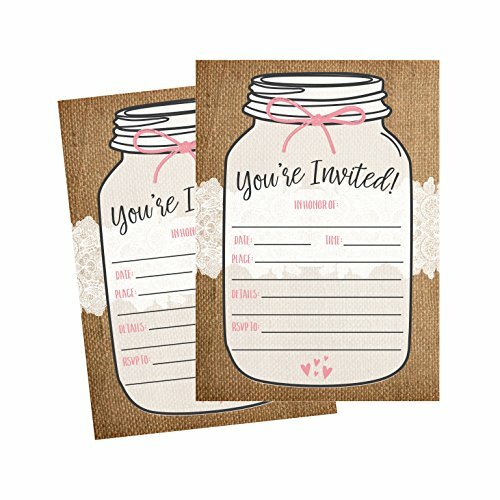 Delightfully casual invitations are just the ticket for a casual celebration! And to make your life even easier – you can find all the matching party supplies – plates, napkins, decorations, party favors and more – on the same site. Pale pink roses and gold ribbons adorn the cover of these beautiful invites. Choose from 6 different styles of paper. 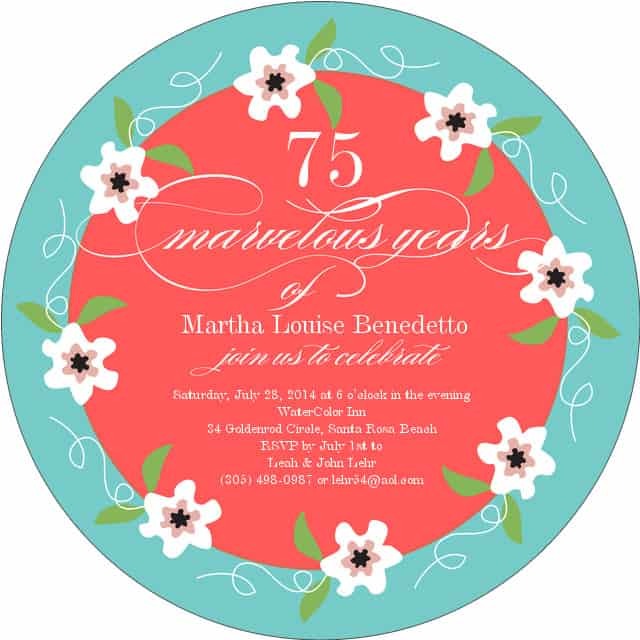 Lovely, ultra-feminine invitations are a fun way to set the tone for your party! Print on just one side, or add photos and text to the back – perfect for adding a map to the venue! 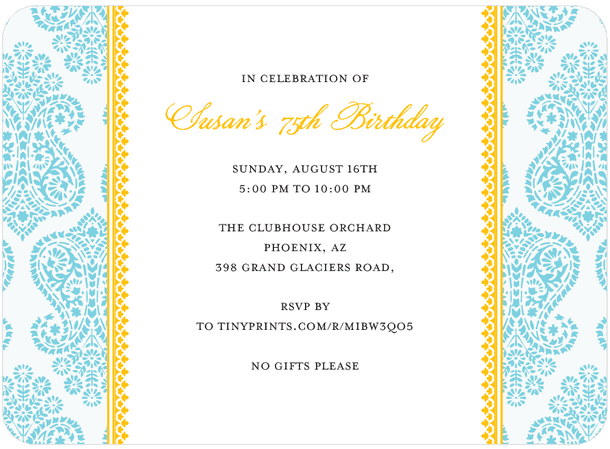 Stylish personalized invitations for women featuring a lovely paisley damask pattern. Choose teal, yellow, purple or pink. Add a little bling to your celebration with these sparkly cards! Choice of 5 border trims. In a hurry? You can have these in just 2 days with Super Rush shipping. The perfect way to show off a favorite photo! 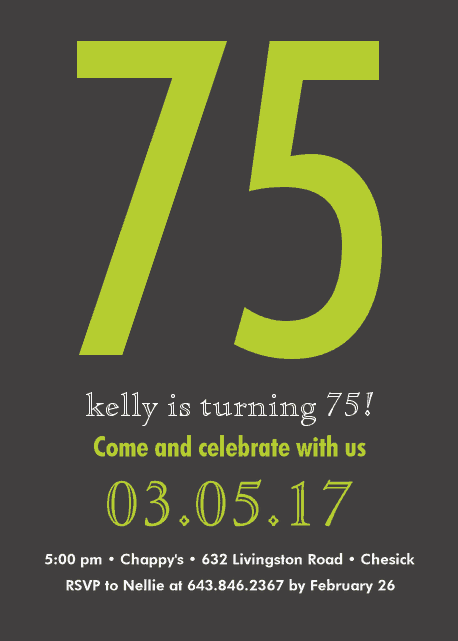 Striking invites can be personalized on both front and back (and don’t worry – you can change the birthday year to 75). Choose 5 different border designs. Also available in pink. When choosing party invitations for men, look for more masculine colors and themes. 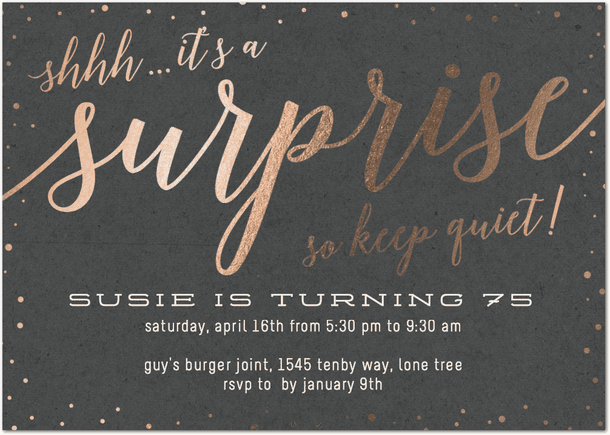 Be sure to choose a more masculine font – I like the bold simple font of this invite on the left. Avoid swirly, curly fonts. Dark colors, stripes, and plaids are always good choices. If he’s got a favorite sports team, consider using their colors. You can also choose to incorporate some of his favorite activities into the invitation. 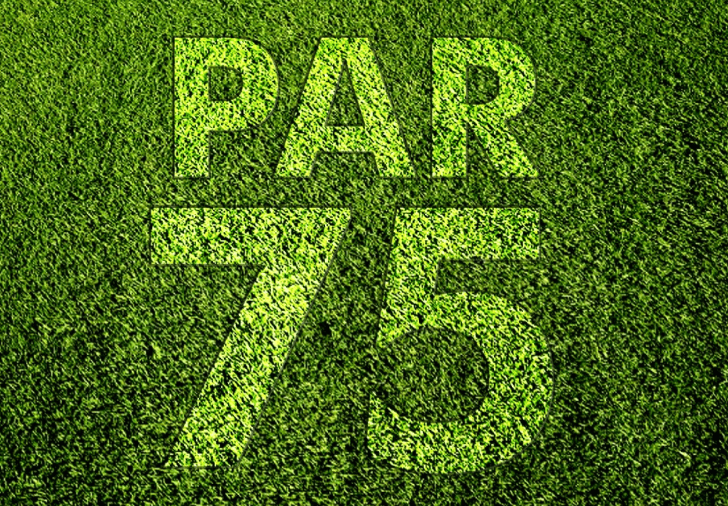 Sports themes are always popular for men – does he enjoy golfing or fishing, for example? If he has a good sense of humor about turning older, perhaps add a funny quote or saying to the card. Or you could choose a funny theme such as “Old Geezer” or “Vintage Dude”. 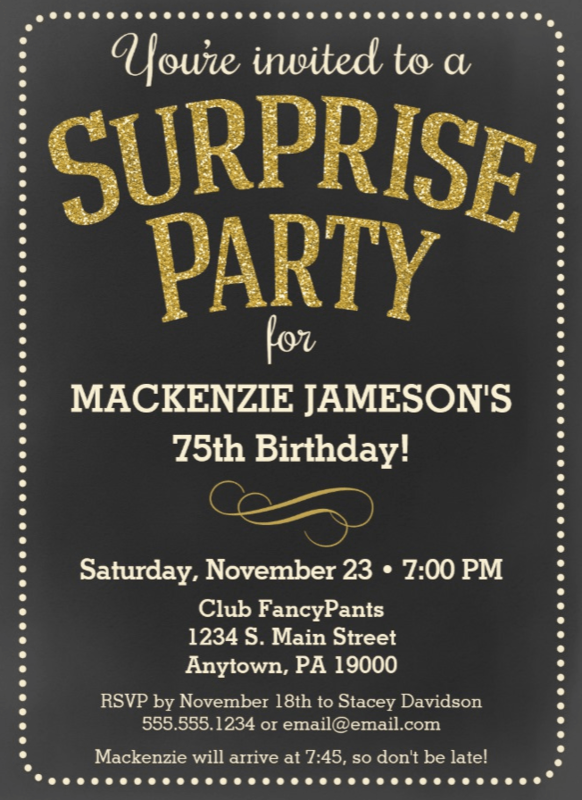 If you’re planning a formal, sophisticated party, then these well-dressed invitations for guys are an excellent choice! 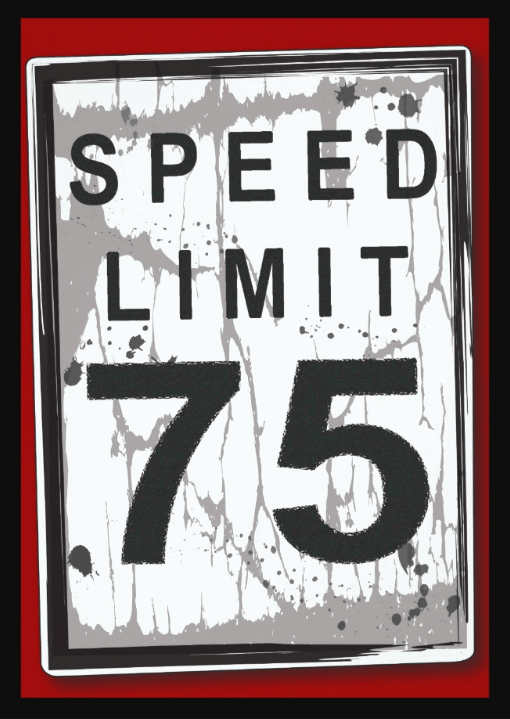 It’s not the age, it’s the mileage that counts! These funny invitations are perfect for the guy who loves cars…or has a sense of humor about turning older. 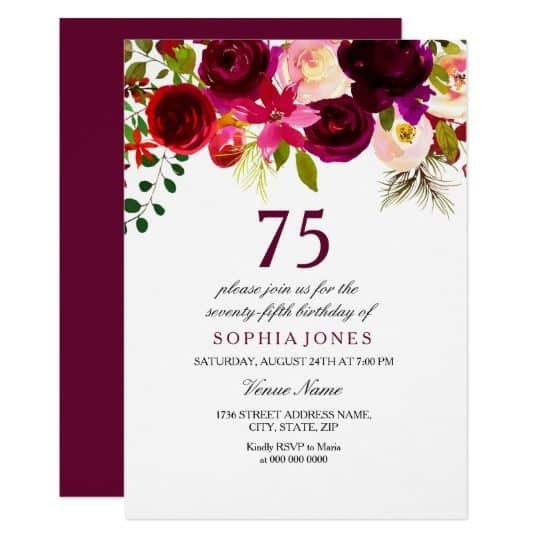 Showcase a favorite photo with these striking invitations. Available in 3 different color schemes. 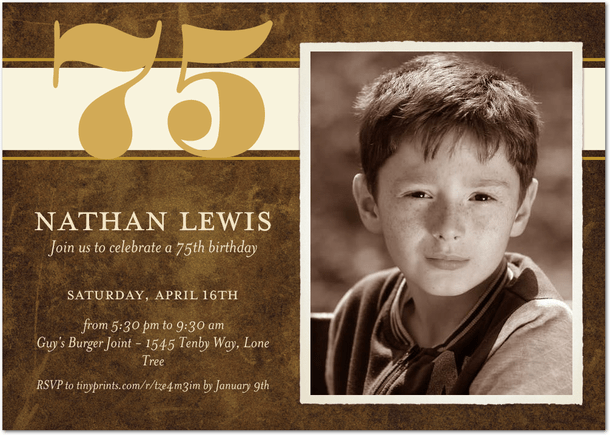 Handsome wood-grain background showcases 2 pictures of the birthday man. 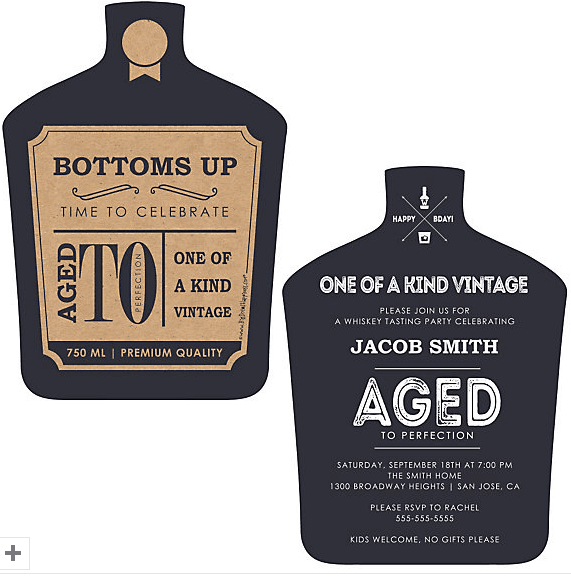 How fun are these masculine Aged to Perfection birthday party invitations? They’re available in 2 styles (including one with photos). 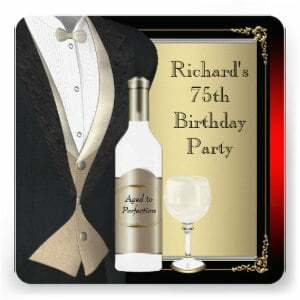 Big Dot of Happiness also has an entire “Aged to Perfection” birthday party theme with all the supplies you need to create a memorable celebration for your favorite man! You can order everything from decorations to bottle labels to photo booth props in just minutes. 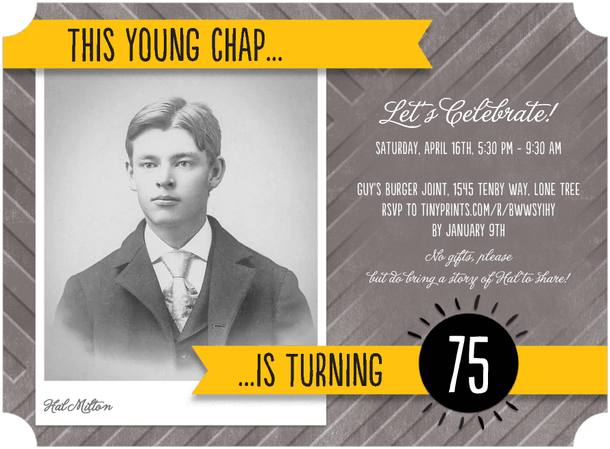 Handsome vintage-style party invitation is the perfect choice for the manly man. 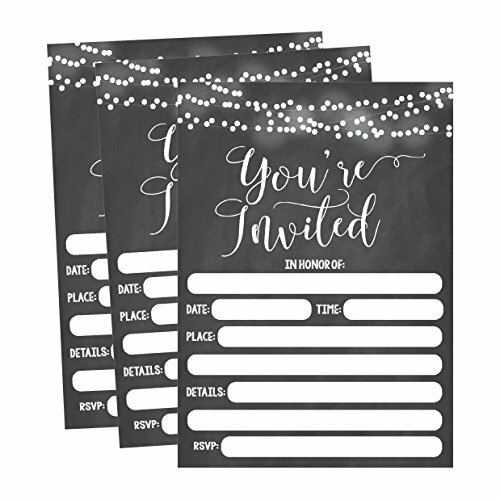 If you’re having a smaller party (or lots of help to write the invitations) fill-in-the-blank invites are a great way to save money! 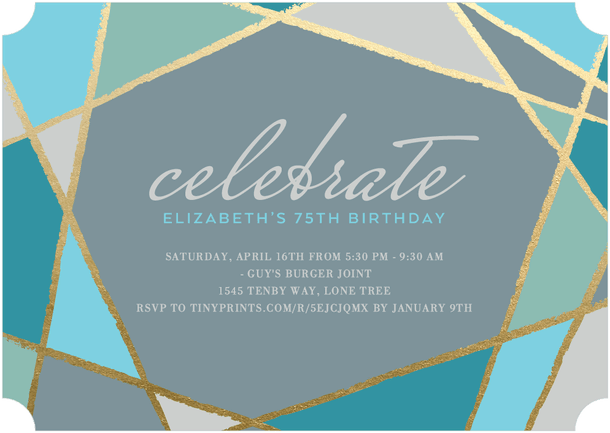 There aren’t any fill in the blank invites that are specifically designed for a 75th birthday, but you can choose any style invitation you would like, and then just mention “75th birthday” when you’re writing the invitation. 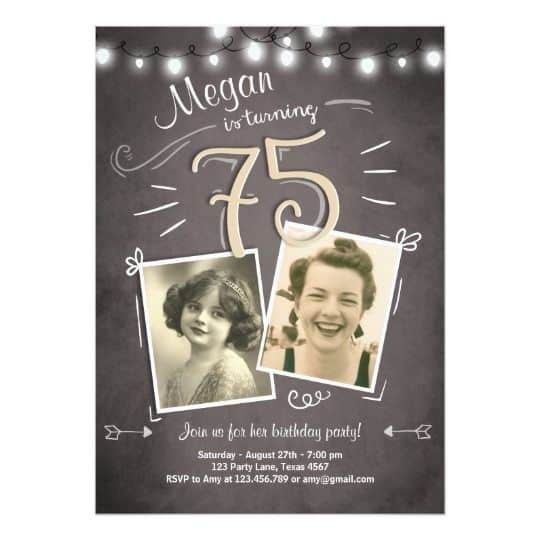 The invitations I’m highlighting here would work particularly well for a 75th celebration, but I’ve chosen these particular ones because these featured invitations all have matching party supplies! So it’s easy for you to get ready for your party without having to search high and low for matching decorations. Click here to see the matching Vintage Dude party supplies. 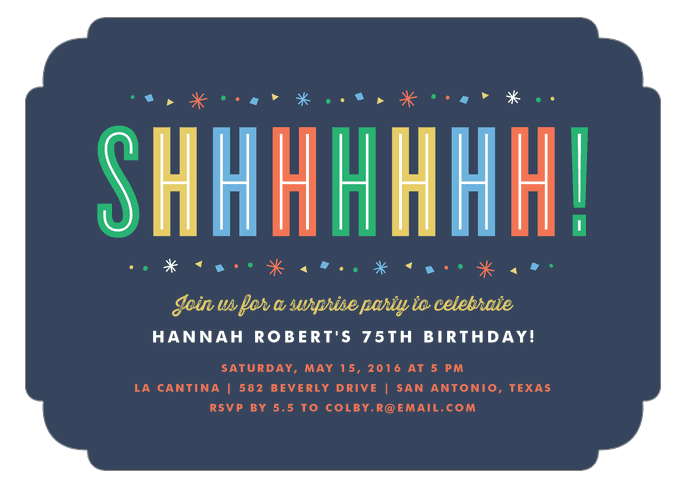 You don’t have to pay a fortune for personalized invitations! 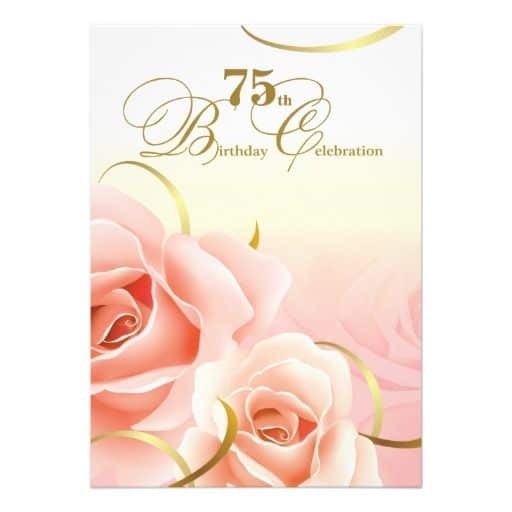 Shindigz has an amazing selection of birthday invitations that include pictures with prices starting at under $1 per card, which includes envelopes. The price per card goes down as you order additional cards. 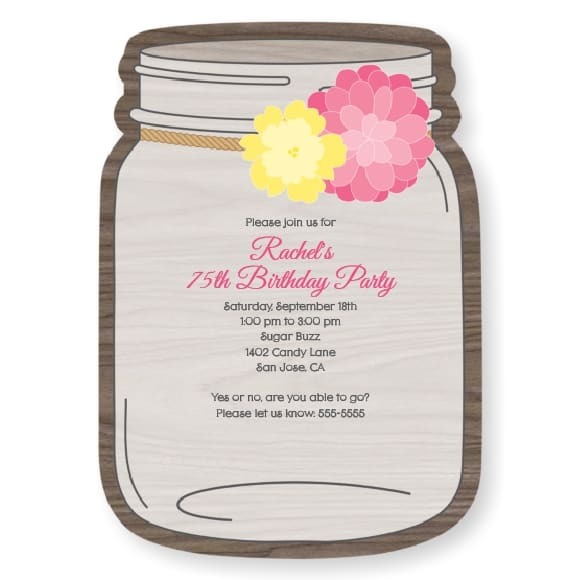 Shindigz also offers a complete line of party goods, so you can take advantage of on-site coupons and reduced shipping costs to save even more. Great quality at a reasonable price! 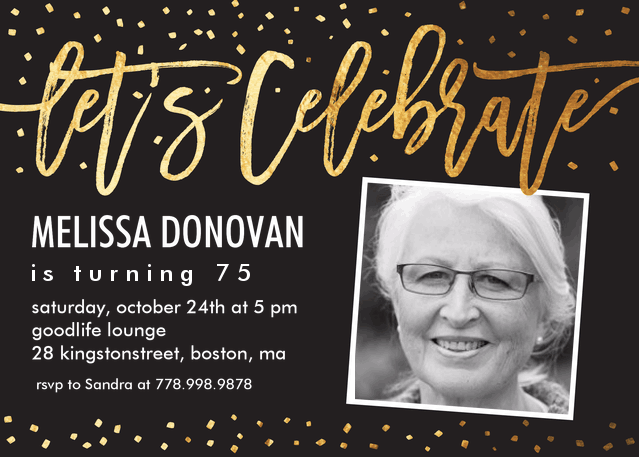 These personalized invites are a delightful way to showcase a favorite picture of the birthday celebrant. 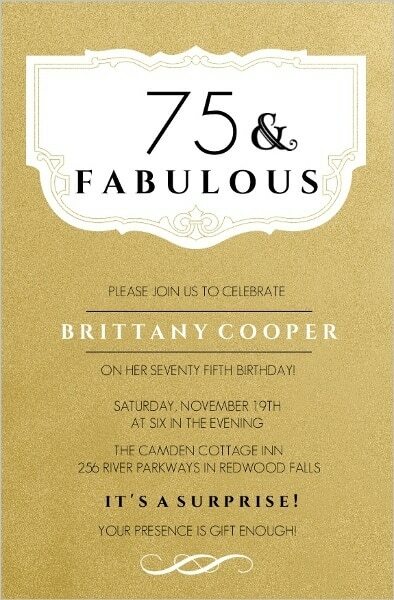 Stylish chevron pattern invitations feature 3 pictures. 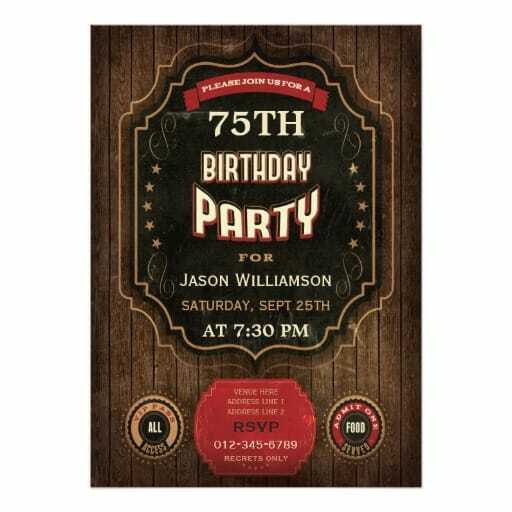 The background and font colors can be customized to any color you choose, so these could be used for either a man or a woman’s party. 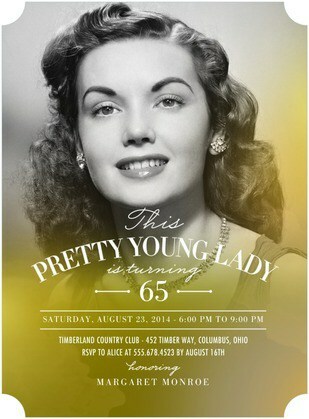 Quickly create a classic affordable photo invite…just upload a favorite pic and fill in the party details! Who doesn’t love a themed party? Themed parties give people an excuse to dress up and join in the fun! If you’re throwing a themed event, start the celebration on the right foot by choosing invitations that match your theme. This will let the guests know what to expect at the party. 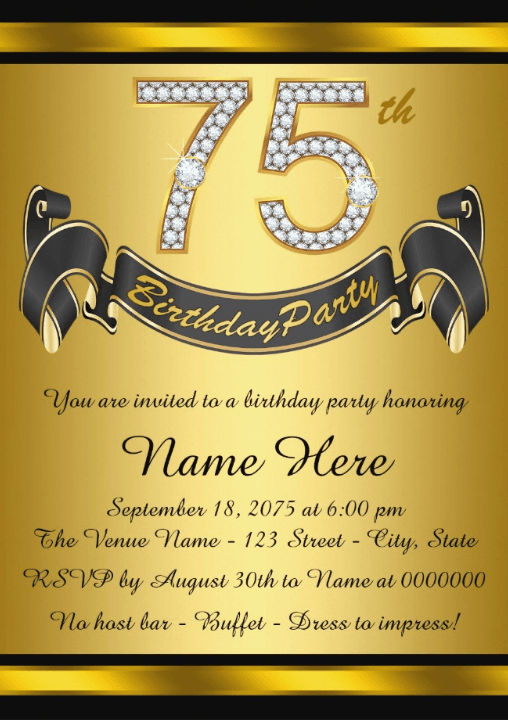 Be sure that your invite includes all the normal information, such as date, time, and place. However, your invitation should also indicate what type of event you’re hosting – formal, casual, whether certain attire is required. Who doesn’t love a BBQ? 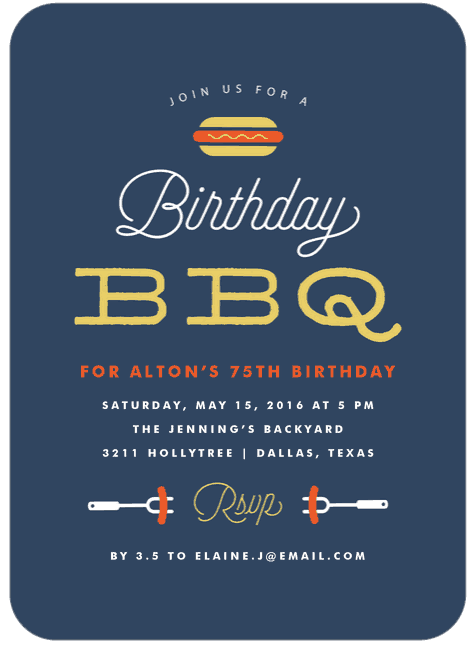 If you’re planning a cookout for the 75th birthday, check out these fun invitations! 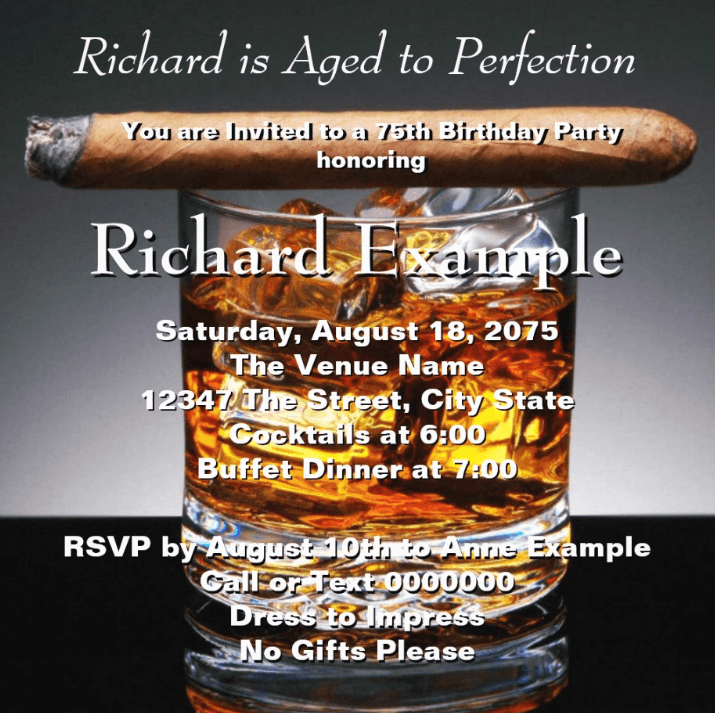 Celebrate in a manly, old-school style with a whiskey and cigars party! 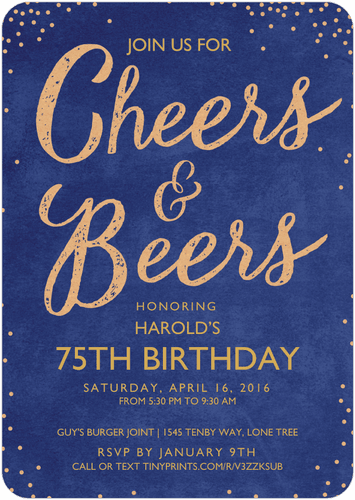 Celebrate your favorite beer-lover’s birthday with a festive Cheers & Beers party! 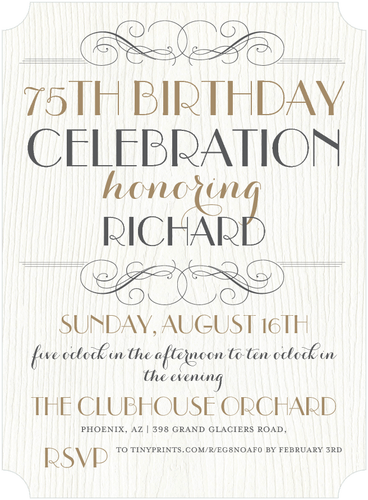 Personalized invites are available in cream, black or navy. Planning on an elegant tea to celebrate this milestone occasion? 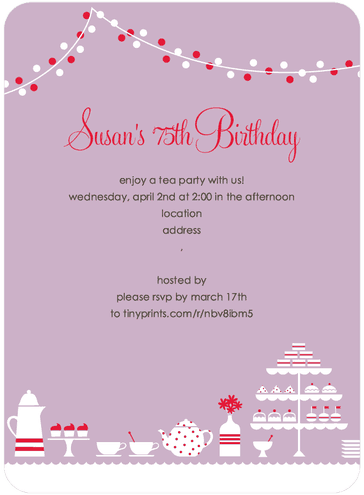 These delightful tea party invites are available in 4 cheerful colors. It’s not just a party…it’s a fiesta! 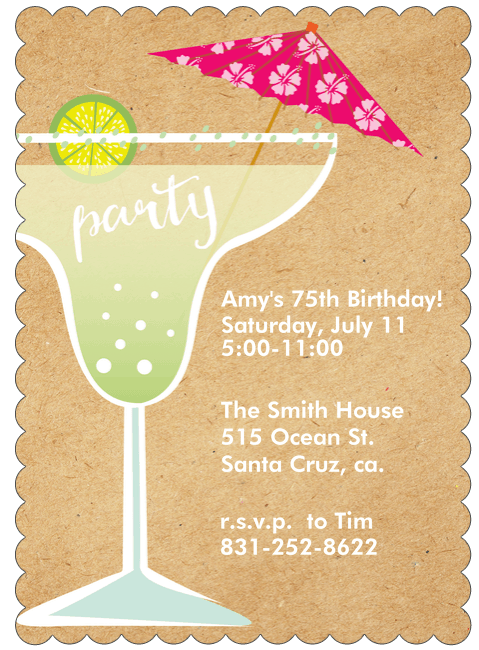 Cute margarita-themed invitations are the ideal choice for a south-of-the-border themed bash. Hit a hole in one with unique golf themed invitations! 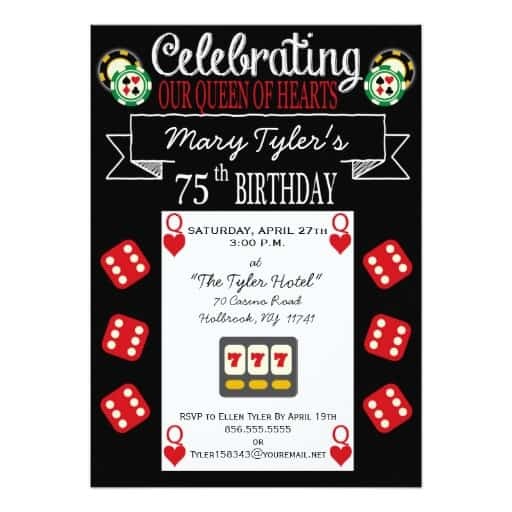 Invitations are the first impression your guests will have of the party. If you’re using certain colors for the party, try to find invites that incorporate those colors. If you’re having a themed celebration (such as a BBQ, fiesta, or luau), invites that reflect that theme are a great way to set the tone ahead of time. 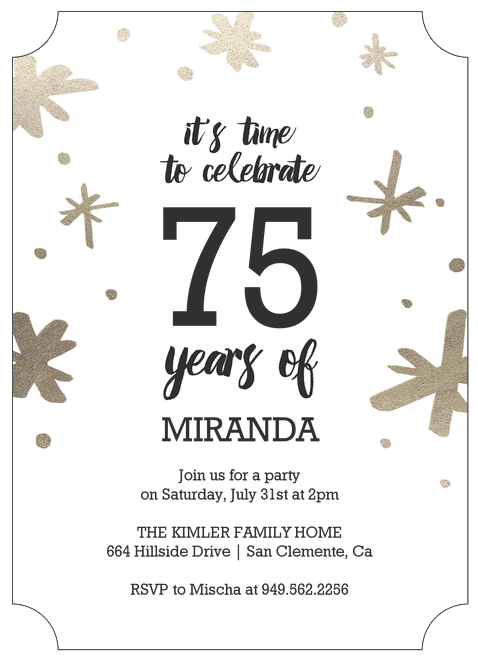 You should plan on ordering your invitations as soon as you’ve set the date and place of the celebration. This will give you time to choose the invites, order them, and then address and mail them to the guests. 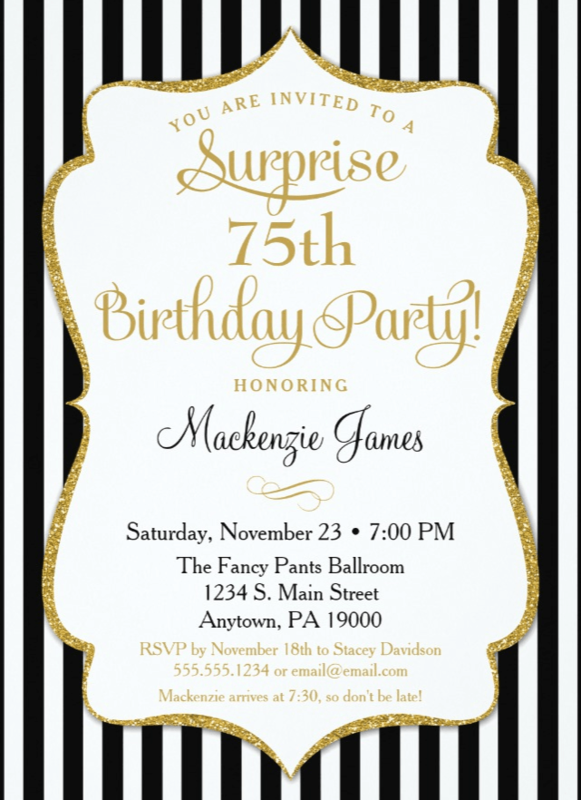 Generally, party invitations should be mailed four to eight weeks before the event. If you’re inviting out-of-town guests, you should send invitations eight to twelve weeks ahead of time so that they can make travel arrangements. 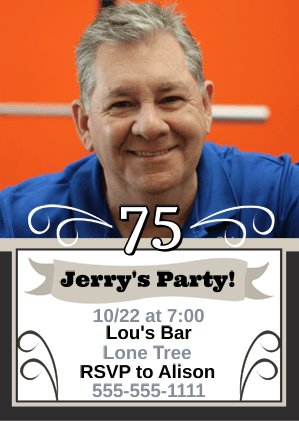 The wording you use on the card depends upon the type of event. For all events, however, be sure to include the reason for the celebration, the date and time, and address of the party. 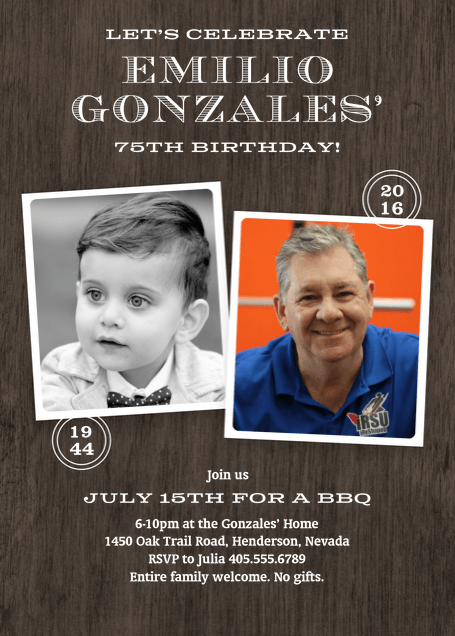 Be sure to include RSVP information and a respond-by date if needed. You may wish to specify “Regrets Only”, which means that the invitee only needs to contact you if he or she is unable to attend. at a (type of party – cocktail, dinner, etc) party. SAVE MONEY - Only $.29 per card! Compare it to other sets that cost $.60 per card!! !